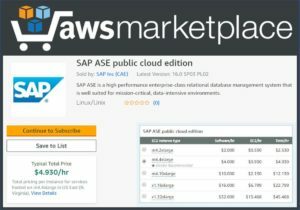 SAP has launched extreme transactional processing capabilities on AWS marketplace with new hourly (on demand) pricing for SAP ASE. SAP ASE public cloud edition is the Enterprise Edition plus advanced options including: Security, Encryption, Compression, Partitioning and Workload Optimisation. We are currently testing out the new service – watch this space for our reviews. Contact us to talk through how we could help you move to the cloud.